Any greens which are commonly cooked can be preserved through freezing. Besides Swiss chard (above) and others I’ve already mentioned, you can freeze collards, spinach, dandelion, and — if you can bear the taste (I can’t) — mustard greens. In the case of beet-greens, select only the youngest, most-tender leaves for freezing. Some gardeners simply wash, pat dry, and then freeze their greens. This might work for the short-term. But for longer storage — 8 to 12 months, in fact — do what I do, and blanch them first. When you blanch, you submerge the greens briefly in boiling water, then promptly plunge them into ice water. Blanching destroys the enzymes which cause leaves to lose their green color. It also helps to preserve their taste. According to The Joy of Cooking, the proper blanching time for all greens except collards is 2 1/2 minutes. Collard greens, which are not tender, require a 3-minute boil. Trimming. 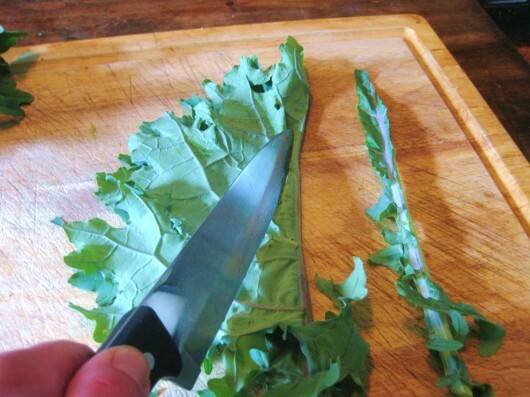 Remove any tough stems from leaves. 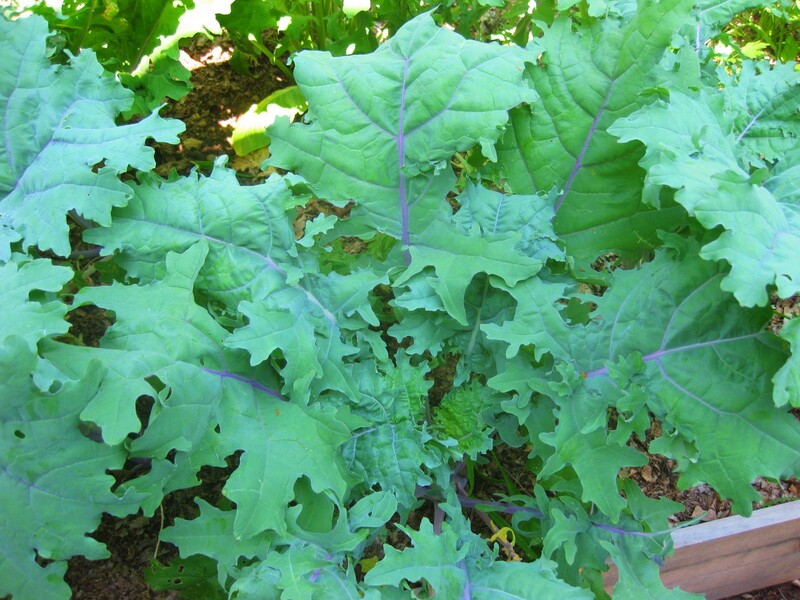 Kale has a particularly fibrous stem; if you wish to keep it, first chop it into one-inch pieces. Then blanch it, separately from the tender leaves, for 3 minutes. Personally, I don’t bother to keep tough stems. Chopping and Cleaning. Roughly chop or tear the leaves, then swish them around in a bowl or sink of water to remove dirt. Blanching. Dump the leaves into a big pot of boiling water; cover, and blanch for 2 1/2 minutes (again, 3 for collards). Timing begins the moment your greens touch the water. Chilling. Using tongs or a slotted spoon, transfer the greens to a big bowl of ice water, and let them sit for 2 1/2 to 3 minutes. Drain well. Drying. 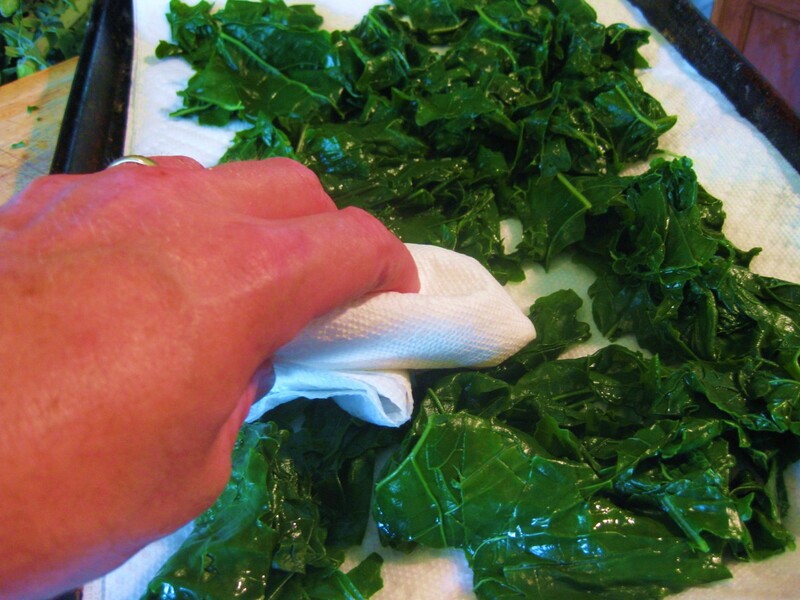 Lay the leaves out on a baking sheet lined with either a cloth towel or several thicknesses of paper towels. Use another towel to blot tops of leaves. The goal here is to absorb excess water. Leaves needn’t be completely dry before you freeze them. Bagging. Arrange clumps of leaves in serving sizes, and loosely pack into zip-lock freezer bags. I use one-quart bags. Be sure to label these as to content and date. Vacuum-Sealing. Would you believe I still don’t own an electric vacuum-sealing device? Thus I express all air from the bag (this to avoid freezer burn) by sealing it partially, inserting a drinking straw, and sucking. Believe it or not, this little gimmick makes a respectable vacuum-seal. And that’s it! Summer-grown greens — when properly blanched, sealed and frozen — can be enjoyed for 8-12 months. Great post, Kevin. Makes me wish I'd planted a lot more lacinato kale! It had never occurred to me to freeze turnip and beet tops. I learn something new here every day! You are my absolute favorite gardening site. I had no idea you could freeze greens! Thanks for the great info. Paula – Thank you for your kind words. I'm blushing. Greg W – Glad you enjoyed the “green” info. Kevin, once again, you speak to me! The last few years I've come to adore all greens and they are profuse in my garden and fridge now. I will happily blanch and freeze to my heart's content, thanks to you. You are my hero and like Paula above, my favorite garden site. Please keep up the good work, and in the meantime, I am enjoying reading your back posts. You are terrific! My Gran always canned and froze garden surplus for winter use…we had the best soup made with just tomato, corn and okra…the greens were cooked into everything from soups to casseroles and I especially loved her ham, kale and white bean soups. Thanks for all the information you share and for reminding me of another great gardener and cook. Cary – thank you for the kind words. Freeze on! Prairiecactus – Mercifully canning/freezing are making a big comeback. Our grandmothers would be proud. LilyBiscuit – You're welcome. Glad to be of help! Thank you Kevin! I just put up 2 big bags of Ragged Jack kale (love that name :)) and of Portuguese kale. Also 3 bags of Emerite green beans and French Gold filet beans. Soo glad to have these preserved and use up the abundance. Enough to share too! I so much appreciate you and your blog/ideas. Ohh, no red tomatoes yet in SE CT, but huge numbers of growing green ones. How were your fried green tomatoes the other day? Stay cool, dear friend! Cary – Glad to hear your preserving efforts are going well. What a challenge to do this work during a heat wave! New reader, and VERY glad I stumbled upon your blog! I wanted to make one suggestion – something I learned while living alone and being a restaurant cook – you can put the blanched, dried(ish) clumps of greens on a cookie sheet to freeze, and then bag the frozen clumps…that way you can reach in and grab one portion whenever you need one. Just like how I freeze fresh berries so they don't turn into a giant block. (if that makes sense). And thanks for all he spectacular info! caitlinvb – very nice to meet you. I like your idea of flash freezing clumps of greens (or berries) on a cookie sheet before bagging them. Thanks for the great tip! I’m going to try this technique! Thanks!!! Also wanted to share an idea for how I like to do it. I blanch my kale in chicken broth and stuff it into a small plastic container, pour the broth over it and freeze to make a huge kale-cube. This is great to drop into soup, stew, etc or defrost over rice. Or, just heat and serve. Very flavorful! Rachel – I like your freezing idea. Kale-cube soup! Rachel – Marvelous idea! Would be delicious over rice. Kevin – I use glass jars which have almost no shoulders, e.g., peanut butter jars or wide-mouth canning jars, for freezing greens and tomatoes. I use a steamer thing that fits right into almost any pan (it unfolds – grocery stores carry them) so the greens don’t have to touch water. I believe this leaves more natural vitamins in them because they aren’t leached out into the boil water. I love opening a jar of last summer’s green in January – luxury! Nancy – I like the steaming idea, and I probably have one of those folding gadgets here some place. According to the National Center for Home Food Preservation, steam-blanching takes 1 1/2 times longer than regular blanching. But it certainly beats boiling a big pot of water, right? Ah-HA! So that’s the kale I have growing that was a seed in a mystery packet! hehe. I’ve attempted to freezer-preserve before… failed everytime [bag get’s really icy inside. Greens get tough and the texture is off..] then I realized something: I wasn’t putting them in an ice bath! that must be it! That, or the bags I use don’t have a good seal on them… /sigh. Donna B. – Glad you were able to I.D. your mystery kale! I think the ice-bath is the key to good texture of the greens after freezing. So much great information! I can’t wait to try freezing kale (one of my fave veggies)!!! Thanks Kevin! Our ways of preserving Greens are exactly the same right up until the bagging. I put them in my dehydrator and let ‘er rip, then bag them and forego the freezing. Unfortunately it’s far too hot for Greens here right now, but it’s just about time to plant the seeds for a winter crop. 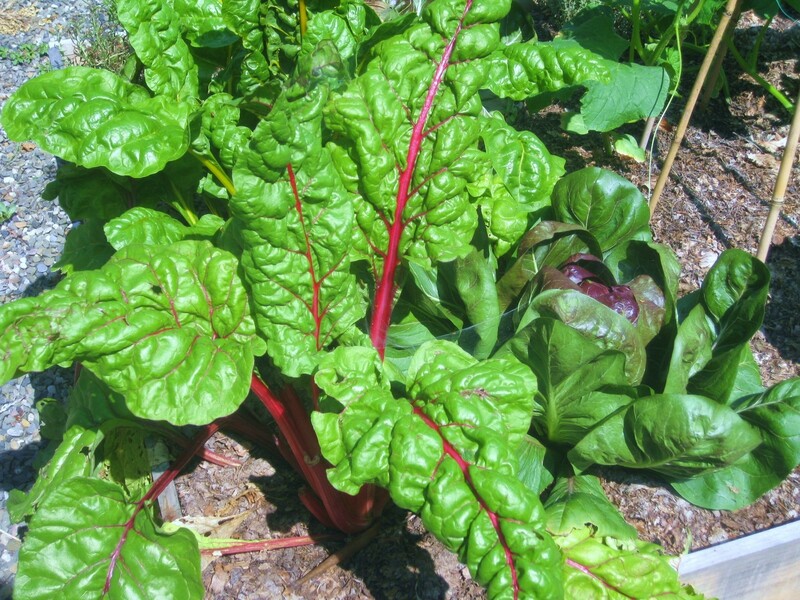 Perfect timing-I was going to look on your website to find instructions for swiss chard. Mine is growing so well in this heat. I want to enjoy it all winter-thanks for the how-to instructions. Kevin, I really enjoy your weekly tidbits! When I was blanching and freezing my very first green bean crop last year I had an idea. I used an ancient metal collander to hold the beans. Super easy to drop into big pot of boiling water and even easier to pull all the beans out in one fell swoop (with tongs) and drop whole thing into big container of ice water. No fishing around with a slotted spoon needed (I was obsessing about the precise amount of time to have the beans in the hot blanching bath). Yes, the metal collander is ancient and beat up, but it still works beautifully! I would imagine that some of the ‘new fangled’ silicone ones would work also. New to gardening and love this information on how to freeze Kale…gonna try today to freeze some. Not only does our family eat it, but we have a tortoise and Hamster that loves it too. Thank you. The Staples-Cooper Family! You know, I did not think it possible. I had tried in the past and only got weird see through waterlogged leaves. I guess the straw is the trick! Just found your site when looking up ideas on how to use Kale. We are 3rd year gardeners and having a great time working it with the kids. I am going to list you in our garden links. I’ve been experimenting with freezing basil leaves. So far it seems to work and I still get that great basil taste that you only get when it’s fresh. I cut a piece of waxed paper, fold in half, then fold in half again to make pockets that slip into a quart sized ziplock bag. I wash the leaves and let air dry then slide in between the sheets of waxed paper inside the ziplock. I make a lot of tomato basil soup in the winter so I’m freezing just enough basil per ziplock bag for one batch of soup. I’ve heard the leaves turn black when frozen but I’ve not experienced that yet. I’m still experimenting on the time limit for leaving the basil in the freezer. Thanks for the tip! I’ll try it. We do have one of those vacuum sealers and it’s great, prevents damage on frozen foods AND it’s also good for sending meals (like garden lasagne) to people who might be under the weather, just had a baby, or for some reason can’t cook at the moment. That way they can heat it up or freeze until they need it. No mess, no plate to return. Here at ArtistryFarm, instead of blanching in water, extra greens are rinsed, chopped and sauteed for a few minutes in the iron skillet with olive oil and garlic (kinda like wilting greens) drained by tilting the skillet and then thrown into plastic bags for freezing… Love your info, Kevin. May I share an idea with you? After you’ve fiished cooking immediately put a pot of cold water on the still hot burner. This way the water absorbs the latent heat not you. . I have neglected my greens (collard, kale, lettuce) the last couple of weeks and when I checked them tonight they are very big and full of aphids. What should I do with them now? If I cut them off will they grow again or is it too late? Some of my lettuces have gone to seed, as well as my broccoli. With all the aphid should I compost them or not? The aphid are spreading to my tomatoes, so how can I control them naturally? Any advice or ideas are greatly appreciated! Hello Kevin, Some time ago I came across your website by chance, had a quick look and tagged it to my favourites list as an interesting site. Since then I have received the monthly versions and have come to really look forward to it. Your gardening and cooking ideas are, to me really terrific, (even though your seasons are reversed to mine, I’m in rural country New Sout wales in Eastern Australia). Some of your other ‘tips’ amaze me that I never thought I such useful and practical ideas. Thank you Kevin. I dehydrate kale and spinach to use in winter for soups and stews. It reconnstitutes itsekf when it cooks. I even add greens to my spaghetti sauce. Started a whole foods, plant-bases diet 3 months ago and juice with kale every day. Can I freeze kale as instructed, let it thaw and juice it or will it not have any juice like French kale? I’d sure like to know before I freeze a bunch. Thanks. Hi Sgc – Kudos to you for starting a whole-foods diet. I have never tried to juice my blanched, frozen kale. Maybe try it with a small quantity of leaves, and see how it works out for you. 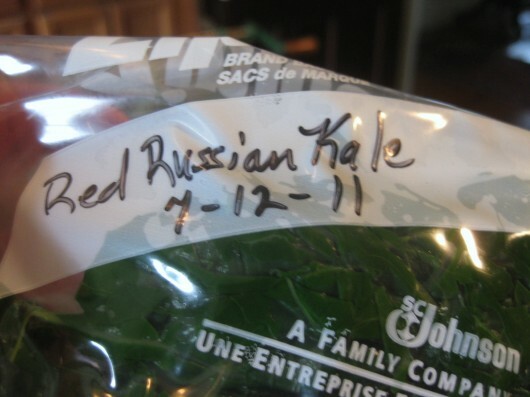 Kevin, that was SUCH a great write-up about freezing Kale. Thank you for taking the time to do it so well…I had to smile at the “straw vacuum seal” creative idea because I have never used my electric vacuum sealer for years now. I want to save two cups of washed, shredded Kale leaves at a time for my Tuscan Zuppa recipes in the future, so you really helped with the blanching info; I was wondering if it was needed because Basil can be directly frozen in water, making cubes or without water. This recipe I found online is close to Olive Garden’s wonderful Zuppa Tuscan (zuppa means soup in Italian) but O. G. has their own blend of seasonings and proportion unknown and they use very little cream in water which we like better. The online recipe has way too much heavy cream in it. Both versions are a wonderful Sausage, Potatoes & Kale recipe. We love it. Great for breakfast, also. I was just writing another lady online who figured out how to blend Kale and save it that way for other types of recipes. I see all these folks talking about Blanching greens like Kale. are they aware of the damage that they are doing to the nutritritional value of these vegtables ? you are rendering them as worthless as store bought canned junk. so, why bother ? Hi Bart – Once veggies are picked, enzymes start to break down the nutrients. Blanching stops this action. From Organic Gardening (dot) com: Tests have shown that, after nine months, vegetables that were blanched before freezing retain up to 1,300 percent more vitamin C and other nutrients than vegetables frozen without blanching. Love the tip about creating a vacuum by sucking air with a straw. How clever! Just found this website after looking for ways to freeze my abundant greens this year – yay! However just wanted to say: those stalks you take off collards, kale, etc. – don’t throw them away, juice them with your next juice! I have only just found this site and I love it already!! Thank you Kevin:) I have some beautiful kale/chard and even collards growing – I’m thinking that we will never eat it all and cannot bear to throw away the fruits (or in this case vegetables!) of my labor! Ha! I know I have info at the click of a mouse and here I am – all my lovely veggies will now be safely stored in my freezer for the coming months – thank you again! I’m Loving ALL these Wonderful Tips from Everyone !!! Love this site, Kevin & Friends ! When I take them out of the freezer for pasta, soup or whatever, it is really easy to just slice off what I want. When I tis sliced, it results in nice, shredded pieces, perfect for adding. If I don’t use the entire roll, I just refreeze (it works fine) or put the rest of the roll into the fridge and use within a day or two. I follow the process that you mentioned but put the veggies in a 1/2 -1/3cup after drying them for a bit, then I put them in the freezer on a baking sheet, until frozen. Then I place them in a plastic baq This gives portions for my green morning slushy to put in my blender. I call them my hockey pucks. I am glad to hear I am not the only one who cannot abide mustard greens. I’ve never blanched my greens before freezing them before, but I’ll try it this time. I have a bunch of swiss chard that I must do something with and soon. Thanks for the tutorial! I belong to a CSA and every year, especially in the spring, I get so many greens – kale, chard, spinach that I invariably ended up composting too much as I could not eat it fast enough! No more!!!! Thank you Kevin! Thanks for your wonderful tips. You or someone else may have already mentioned this but for me, the easy way of de-stemming greens (collards, kale, etc) is to hold the bottom of the stem in one hand and “run” my other hand back up the stem from bottom to top which strips the leaves from the stem. It’s a lot faster than cutting the stem out with a knife. If I also want to chop the leaves up, I take the stripped leaves, stack several on top of each other and roll them up like a cigar, then cut the “cigar” into 1/2-1 inch pieces prior to cooking. I know this is an old post, but just in case someone else besides me is newly reading it… I have a couple of tips for this process. Use your salad spinner to pull all the extra water out of your greens after blanching. It works like a charm! I then like to spread the greens out on a cookie sheet to freeze them. After they’re frozen they are easy to bust up and put into gallon size bags, from which I can easily take out however much I want, without having to manage lots of little bags. Love your posts, Kevin. I have found that the easiest way to get Kale leaves off the stem is to hold the bottom of the stem and then, with short strokes, swipe down the side of the stem, cut off the leaves. Do the same for the other side. It’s quite fast once you get the hang of it. Works for Collards and other tough leafy greens. I’m new to kale and need some advice on cooking. I don’t do a lot of soups, stews, etc (any really), but love to eat sautéed spinach. If I blanch and freeze the kale (I have a whole box), is there a way to cook it so that it is like sautéed spinach? Thanks! Thank you for the info. I didn’t realize you could freeze greens. I have a bunch of kale (first time growing) to freeze. Do you need to thaw it before cooking? Great blog Kevin and great suggestions above too! I highly recommend getting a vacuum sealer. It is my favorite freezing gadget of all time! Will be blanching and vacuum freezing some stellar collards this evening. well, I am so thankful for all the info here! But,I believe I got too impatient with the collard greens! I blanched,did not put I ice water,just let them drain ,bagged them and popped them in the freezer..My bad?? I have a lot more greens to do, I will be more patient tomorrow.. 😉 ty all! I dig the kale in late fall, put it in a sunny window and eat fresh through the winter. Pick the leaves from the bottom first. Thanks Kevin! Just harvested a ton and a half lol will be trying your method in 2 minutes. I didn’t blanch my kale and spinach, but I washed and bagged them and kept them frozen for four months. Are they still safe to consume? Are they still as nutritious? Hi – we are really enjoying our broccoli leaves prepared various ways. Do you think 2-1/2 minutes would be too long to blanch them before freezing? I’m thinking a shorter time for broccoli leaves. Hi Rick – I’ve never blanched/frozen broccoli leaves. Since these leaves are tender, I’d go with 2 1/2 minutes of blanching time. Thank you for the great comments on how to preserve greens for use throughout the year. I’m still trying to find some turnips attached to the greens. They are my absolute favorite! I googled “How to freeze Kale” and came across your site. Impressive! However, the recommended blanching – does it not kill all the vitamins? I would appreciate your reply before I start harvesting. Thank you for this post. I’m visiting my daughter in SF from N. Idaho and went wild over the types of kale available in market. Daughter dismayed over the quantity in her refrigerator, but now I will blanch and freeze some for my next visit. Hooray! I’ve never been fond of beet greens. You may have pointed out the problem. The greens on the beets I get at the store are big, and perhaps not tiny and tender enough. How do you get your tiny beet greens?